Never underestimate the power of storytelling. It can take us on extraordinary journeys, cause us to experience a huge range of powerful emotions – and in this case inexplicably invest us in characters that are essentially no more than differently shaped coloured blocks. While Thomas Was Alone is an intelligent, competent puzzle-platformer in its own right; it’s really the combination of its uplifting narrative, endearing personalities, ethereal score and unique gameplay that allow it to transcend its own limitations and become something more… something wonderful. 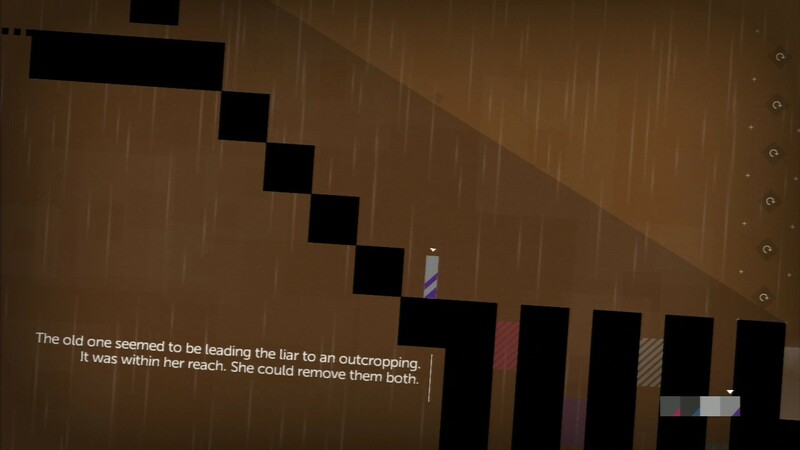 Created and written by game designer Mike Bithell and narrated by humourist Danny Wallace, the game tells the fictional tale of the first self-aware artificial intelligence and its path to self-discovery and enlightenment. Most of this high-concept story is delivered on a more personal level through the amusing inner monologues of its loveable cast of quadrilateral characters; although at the outset of each of its ten chapters we’re presented with a fictitious quote, detailing the event from an external scientific perspective. While the enchanting narrative is often delightfully whimsical and endlessly charming, the overall experience is actually quite profound, unfailingly positive and curiously thought provoking. You might well find yourself unwittingly pondering some of its more poignant themes in your quieter moments for some time to come. 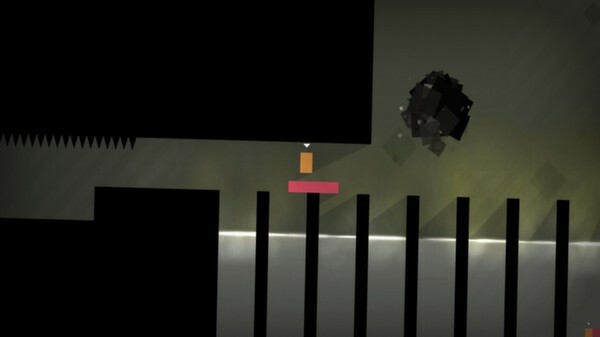 The fundamental gameplay premise of Thomas Was Alone could not be simpler. Starting as the eponymous Thomas, an inquisitive red rectangle, you are tasked with guiding him through minimilist, geometric environments into portals that allow him to teleport to the next area. Apart from sliding left and right, jumping – otherwise known as inverted falling – is the only ability your plucky parallelogram possesses. However as you progress through the game you are introduced to new, differently coloured shapes, each with their own skills and personalities. Claire, a large blue square, possesses the ability to float on water, whereas everyone else simply disintegrates in it. This allows her to act as a makeshift raft for others, although on land she does move rather ponderously. Sarah, on the other hand, is a small purple rectangle who is rather adept at the unique art of double jumping. While this does provide her special access to hard to reach areas, it also gives her quite the superiority complex. As you might have guessed, characters’ abilities often directly affect their personalities, spinning game mechanics into shrewd metaphors. For example, Laura is a downtrodden pink rectangle that other shapes can bounce on, acting as a trampoline of sorts. She worries that her companions are walking all over her, simply using her to get ahead, but eventually learns to find joy in helping them reach new heights. As more characters become playable you are required to alternate between them, moving each in turn to solve increasingly complex conundrums. This provides a strange co-operative feel to the single-player experience, instilling a sense of synergy, that in turn generates genuine empathy. 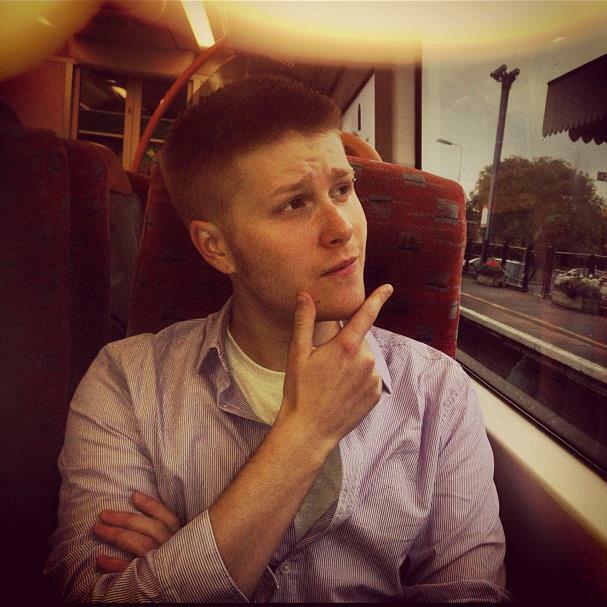 David Housden‘s ambient soundtrack also plays a huge part in cementing the game’s inspirational tone, adding a sense of gravity to the narration and further accentuating the game’s introspective heart. 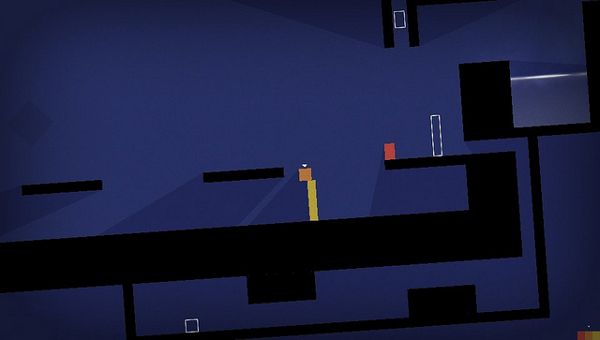 The game’s abstract art style, while exceptionally simple is actually quite beautiful. Your chromatic characters stand out boldly within the shadowy landscapes, which are usually slightly off their axis, giving them an interestingly skewed, other worldly feel. Instructions and subtitled narration artfully scroll across the screen and cleverly adapt to the terrain as you move, although this does make the latter almost impossible to read. Each chapter has an individually coloured twinkling backdrop, which combined with the intuitive in-game lighting system makes for a surprisingly rich and textured aesthetic. Subtle water, steam and pixel effects also go a long way to upping the production value of what is essentially a one man project, bringing it closer to the standard we expect from modern XBLA/PSN releases. 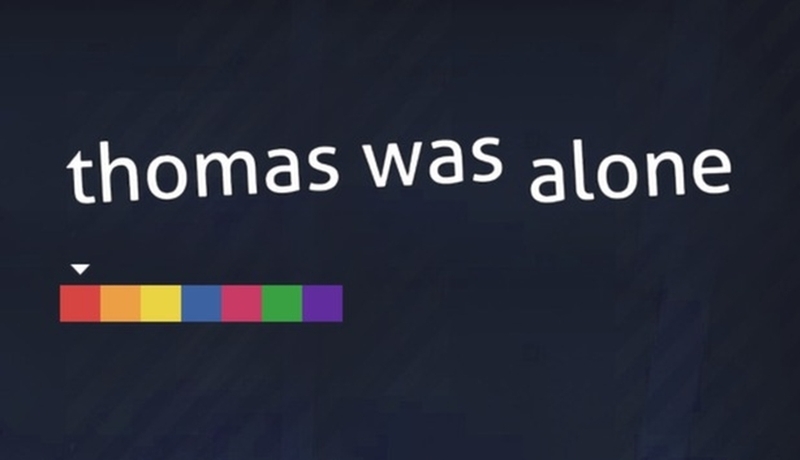 Thomas Was Alone’s learning curve is rather gradual and laid back and even at its most demanding it will rarely tax your cognitive abilities too hard. Indeed most of its challenge comes in the form of its trickier platforming sections, which can be rather fiddly and frustrating at times; although due to each of its one hundred levels being nicely bite-sized, these irritations are usually short-lived and infrequent. 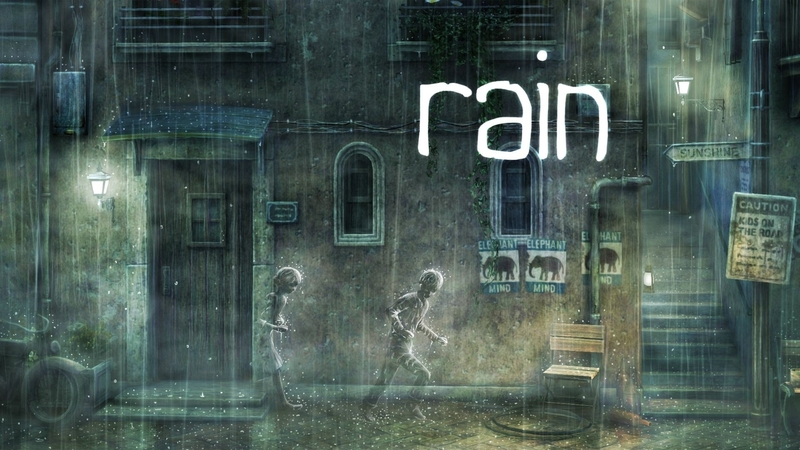 Later on the game does introduce some more unusual, mind-bending mechanics involving anti-gravity and ability swapping paint that manage to keep the gameplay fresh throughout the four to six hour story. The important thing to keep in mind though is that the game’s low difficultly level isn’t necessarily a bad thing. Not only does it allow you to focus on the amiable narration and overall conceit, but due to the consistent driving progression a hypnotic kind of completion cycle is generated, that quickly becomes addictive and tremendously satisfying. In the last couple of chapters the pacing quickens and anticipation builds along with the intensified score. Unfortunately this exciting crescendo ends in a conclusion that does fall somewhat flat; but while this is a bit of a shame it certainly isn’t enough to put a dampener on an otherwise magical experience. Just as the characters in Thomas Was Alone unite and combine their individual strengths to overcome challenges, the game’s separate elements coalesce to form something powerful and affecting. If all you’re interested in is gameplay then perhaps this title won’t necessarily hold your attention. But if you’re seeking something more – something with an engaging story, intriguing characterisation and some genuine heart, then don’t delay. Head straight to the PlayStation Store and for only £5.99, you can make sure that Thomas isn’t alone for too much longer.